The old gods of Northern Europe walk tall in the Annals of Old Moon. Let's meet a few of them. Odin, the All-Father, is the ferocious, one-eyed king of the gods, and is a major figure both in Norse mythology, and in the Annals. He is god of war, death, magick, poetry, prophecy and much else besides. His mighty eight-legged steed Sleipnir bears him on dark winter nights when he leads the Wild Hunt. He dwells in Asgard, and is the head of the family of gods known as the Aesir. His home is the great hall of Valhalla, which lies at the heart of Asgard in the golden-leaved Grove of Glasir. 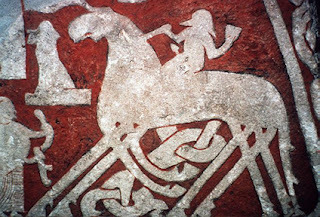 Valhalla is also the home of the Einherjar, warriors who have died in battle and been brought to the hall by the Valkyries, Odin's immortal winged women. There, these heroes spend their days feasting, fighting and carousing, awaiting Ragnarok. Odin wields the Gungnir, in the Annals often referred to the Gravespear, a cruelly-barbed weapon which always flies true to its mark. The Gungnir, like many other treasures of the gods, was crafted by those mysterious dwarves known as the Sons of Ivaldi. Odin is a grim and troubling figure whose dark designs are a recurring pattern in the Word-Hoard of Old Moon. Thor, the Red-Bearded Rager, is the thunder god, and the mightiest of Odin's many sons. He wears an iron belt called Megingiord that doubles his already immense strength, and a pair of magical iron gloves named Iarn-Greiper. These allow him to wield the white heat of Mjolnir, his lightning bolt hammer. Much of his time is spent in Jotunheim, making war upon the frost giants. Fearsome and unmatched in battle is Thor, and many a hapless jotun has fallen to his rage. 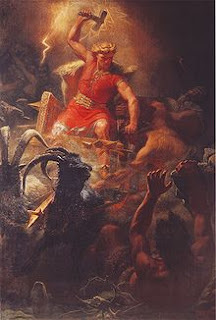 Due to his giant-slaying duties, Thor's strayings into the Annals are few. However, on those occasions when he does come roaring from the Word-Hoard, all remember it, and nothing remains unchanged. Freyja. In the Annals of Old Moon, this goddess is markedly different from how she is portrayed in Norse mythology. In traditional myth, along with her brother/lover Freyr, she is ruler of the Vanir, the old gods of nature. In the Word-Hoard she is Fireya, the Royal White Dragon; Queen of the Earth, of the beasts, and of all the myriad beings of land, sea and sky. She rules her court, the Aristocracy of Beasts, from the White Dragon Isle (called by some the Isle of Wights). It is the holiest ground in all the Nine Worlds. She is the soul and centre of the Annals, and we're sure to meet her again in future posts. Freyr. Of this god, the Annals tell little, as yet. Some say he is an immense golden boar, or the god of the Sun, or both. Or neither. When asked about this being, Old Moon merely smiles, and taps his nose.